One of the biggest areas of growth for Facebook has been Asia. In Q3 2013, the daily active user (DAU) count in Asia surpassed Europe and it grew to more than U.S. and Canada the year before. The revenue coming from Asia has grown steadily, too. In Q1 2013, Facebook reaped $176 million in ad revenue from Asia — a figure which has grown to $333 million. While worldwide, there was a sizable drop in average revenue per user, there was very little dropoff in Asia. For the next set of apps like Messenger, Instagram and hopefully soon WhatsApp, the current priority is growth. Messenger and Instagram both reached 200 million monthly actives this quarter. We believe these apps have a lot of room to grow and will start to be important businesses in the future, but monetization isn’t our near-term priority here. And for the new apps that we’re building as part of our Creative Labs effort, we’re still in the very early stages of development. We’re working hard to develop the technical foundations for these services so that we can rapidly launch new products and then refine them based on the initial feedback from our community. 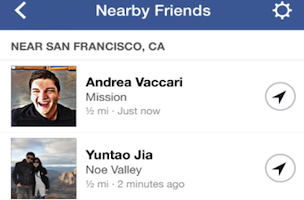 How long until Nearby Friends incorporates advertising? COO Sheryl Sandberg touched briefly on Nearby Friends, which launched recently. It’s a way for users to opt-in to a location service that would show if they’re near another Facebook friend. Like many features that Facebook launches, there’s always the possibility that it could be utilized for marketing or advertising. That kind of specific geographical information could be a gold mine for small businesses, who could serve ads or offers to users who are within a certain radius of the brick-and-mortar store. But, rolling out slowly, but it’s a great product experience one we’re excited to be able to offer. We use the information like this to enhance all the services we provide, and make things more relevant including relevant ads. Sandberg also talked about autoplay video ads, which marketers used with great success in Q1. She called these video ads a big opportunity, and one driven by the advances made by smartphone technology recently. We also have been in early conversations with some clients about what would be a CPM autoplay video ad and in terms of the expectations for that, we really want to see autoplay video ads be something that’s pretty common in the News Feed experience based on consumer usage before we push very hard in the ads business. So we remain long term very excited … but as I said in my remarks, we won’t see a material contribution from it this year. Readers: What did you think about Facebook’s Q1 performance?